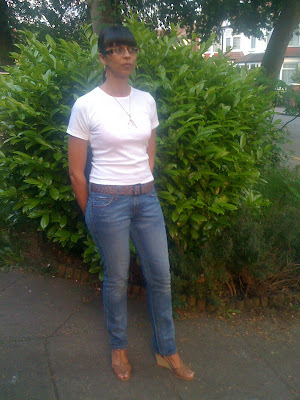 The fabulous Pamcasso at squareoldsoul.blogspot.com is doing an exciting project of a white t + jeans. 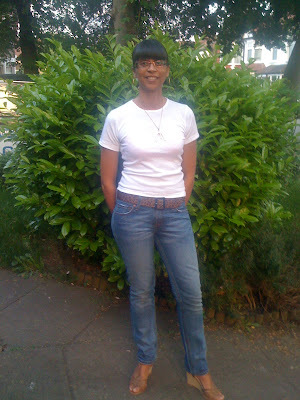 Please check out her excellent post for further information-click on my title for a link directly to her blog. Casual chic! Love that belt, of course. Hi Wendy!! Thanks, yes you can't beat a bit of leopard print!! I like it! Sometimes simplicity brings out the best in a person! Hi cate-Thanks!! Yes, Pamcassco has hit on an excellent idea-pleased to hear you are going for it too! Hi angie hearts-thanks so much! You are so right-it is an easy chic look to get into! Thank you so much for mentioning my project! I got your email, things have been a bit hectic so I'm sorry I didn't write you back yet! Hi pamcasso!! No worries-I really hope you have an excellent weekend and then you can get back into this excellent project of yours! !